French onion dip is always a perfect complement for potato chips – so what better than French onion seasoning to go with your Mrs. Fisher’s chips? 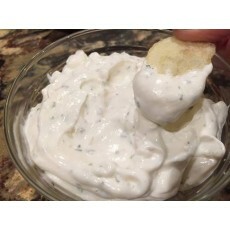 The traditional use for an 8 ounce bag of our seasoning has been the French onion dip which is made simply by mixing one tablespoon of our seasoning with 16 ounces of sour cream. The French onion dip is not the only use for our seasoning, however! You can also create your own French onion style potato chips at home by sprinkling the seasoning over some Mrs. Fisher’s chips and placing them in the oven around 300 degrees for approximately 10 minutes. Dice 3 large potatoes into roughly half-inch cubes then mix well with 3 tablespoons of oil and 3 tablespoons of French onion seasoning in a bowl. Spread the well coated potatoes onto a cooking sheet and cook at 350 degrees for approximately half an hour or until golden. For roughly 4 or 5 drumsticks you’ll need to mix 1 cup of unseasoned bread crumbs, 1 cup of Panko bread crumbs, 1 tsp. of pepper, 2 tsp. of garlic powder, and a ¼ cup of our French onion seasoning thoroughly in a large bowl. Dunk the drumsticks into a bowl of buttermilk, roll them into the breading mix, and fry at 350 degrees for approximately 15 minutes or until lightly browned. Enjoy these recipes and don’t feel hesitant to construct recipes of your own using our French onion dip mix!